A well camouflaged male cabezon guards his eggs in the nearshore waters off the Mendocino Headlands (Photo by Mark Winscher) Hint: click on the photo for a closer look! Answer: Wow, this was news to me and to most people I mentioned it to. Since receiving your letter, I’ve done some research and found that cabezon eggs are indeed poisonous to humans, as well as many other mammals and birds. The term for fish roe poisoning is ichthyootoxism. People who have eaten the roe and developed symptoms soon afterwards describe: abdominal pain, nausea, vomiting, diarrhea, intense thirst, bitter taste, trouble swallowing, cold sweats, rapid irregular weak pulse, dilated pupils, fainting, chest pain, pale skin, tinnitus, etc. Yikes! In severe cases, muscular cramps, convulsions and coma have occurred. Victims usually recover within five days, but deaths have also been reported. To most of us, cabezon are a popular game fish and delicious dinner fare. They occur statewide and typically hunker down in rugged rocks and kelp beds in shallow waters less than 100 ft. deep, but may range out to 250 ft. Female cabezon lay their eggs in very shallow water, so the evolution of toxic roe is likely one of their clever adaptations to help protect their eggs from would-be predators. Male cabezon then bravely guard the nests and chase away most threats to their incubating offspring. If the eggs are laid in water too low for the protective dad to guard at low tide, they could be preyed upon by a variety of unsuspecting hungry birds and small mammals. In 1949, a large female cabezon loaded with ripe roe was collected at Scripps Institution Reef. Scientists remembering Hubbs’ experience decided to conduct an experiment to test the toxicity of the roe on 12 rats and two guinea pigs. In addition to their regular food, they were given a cocktail containing the roe mixed with water. Four of the rats and one of the guinea pigs died, and all of the animals exhibited diarrhea and nasal discharge. Now don’t let the horrors of the toxic symptoms you encountered scare you away from cabezon because they are pretty cool fish. They can grow to more than three feet long, weight more than 25 lbs., and they come in brown, red or green with lots of darker mottling to help with camouflage. Females are larger and usually more greenish while the males are more reddish. Females lay large masses of eggs that may be white, pink, red, maroon or blue-green initially but mature to a more olive color. Cabezon also have smooth skin without scales and they are really fun to catch! Even better, when filleted, their flesh is usually blue or green but then turns white once cooked. People always ask why their skin and flesh is blue or green and Dr. Milton Love, researcher at U.C. Santa Barbara, wrote in his book, Probably More Than You Want to Know about the Fishes of the Pacific Coast, “The blue color of cabezon flesh is harmless and disappears when the meat is cooked. The color may come from copper-based compounds in the shellfish they consume.” In addition, archeologists have found cabezon remains are common in Native American middens. 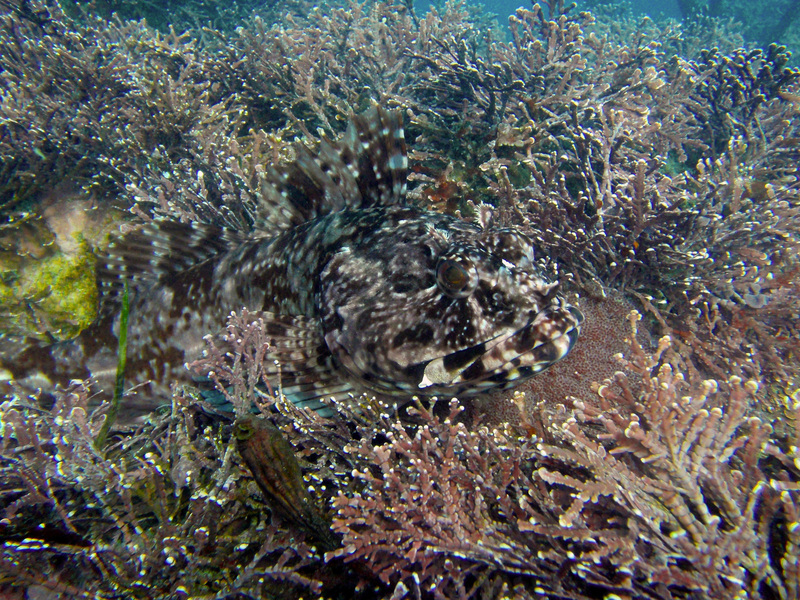 Yep, cabezon are cool … just don’t eat their roe! This entry was posted in Finfish, Fishing, Food/Health, Saltwater Fishing, Uncategorized and tagged health warnings, ocean fishing. Bookmark the permalink.